Heat gas or charcoal grill to medium heat. Cut 14 x 14-inch piece of heavy duty foil; spray foil with cooking spray. Place dough on foil; starting at center press dough to 12-inch round. Place dough on grill, foil side down. Cook, covered, 3 minutes or until bottom of crust is light golden brown. Remove from grill. Using wide spatula, flip crust over so uncooked side is down. 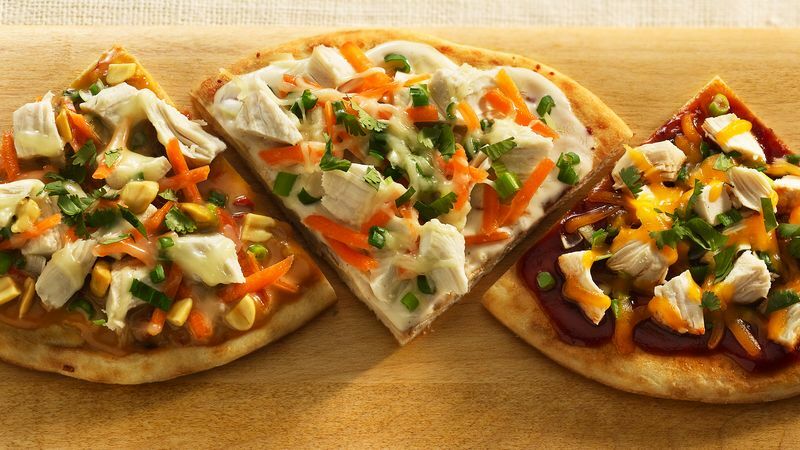 Spread pizza crust with peanut sauce. Top with chicken, carrot, onions and peanuts. Sprinkle with cheese. Place pizza onto grill, foil side down. Cook, covered, an additional 3 to 4 minutes or until crust is golden brown and cheese begins to melt. Sprinkle with cilantro. Substitute barbecue sauce for the peanut sauce. Omit the carrot and chopped peanuts. Use Cheddar cheese instead of the mozzarella.